Landry Shamet’s defense and intelligence helped punch his initial ticket into the 76ers’ rotation, which needed depth on the wing after Wilson Chandler went down with a hamstring injury in the preseason. But the Wichita State product’s shot-making has certainly helped him stick. In Thursday’s 122-113 victory over the LA Clippers, Shamet tied a career-high with 13 points. He went 5 for 8 from the field, and 3 for 6 from the outside. The 2018 no. 26 pick also wasn’t afraid to go toe-to-toe defensively with veteran members of LA’s backcourt, which included the feisty Patrick Beverley. 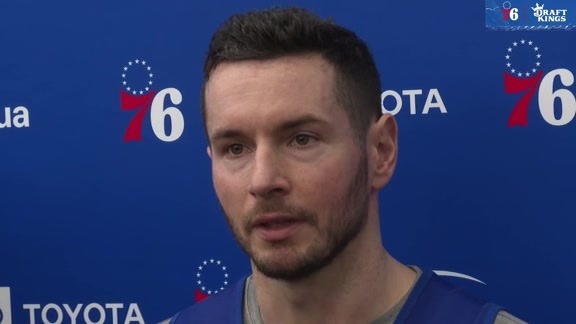 Since training camp, it’s been well-documented that JJ Redick has taken Shamet under his wing. The 13-year vet praised the rookie for being bright. “He picks things up pretty quick,” Redick said of Shamet. Lately, conversations have revolved around the highs and lows of the NBA. Recently, as Mike Muscala has gotten more and more into rhythm, and farther away from the right ankle sprain that kept him out of the first three games of the season, he’s proven to be a productive frontcourt complement to Joel Embiid. In 72 total minutes together in six games, the duo has generated a net rating of 13.6 (114.2 offrtg / 100.6 defrtg). So far, it’s the highest two-man net rating Embiid has produced with another player (we’re going to discount the super-elite 37.5 net rating Embiid has manufactured in just 12 minutes with Furkan Korkmaz). Against the LA Clippers Thursday, Brett Brown went with the Muscala-Embiid combo to close out the game. Twice in the fourth quarter, Muscala found Embiid for a basket. Brown maintains that Muscala, an off-season trade pick-up, will only become a better match with the Sixers over time.